Like most finishes, "brass" encompasses many shades and tones. Everything from shiny gold to vintage-y bronze. We prefer the latter, but we've been known to embrace some shiny too. 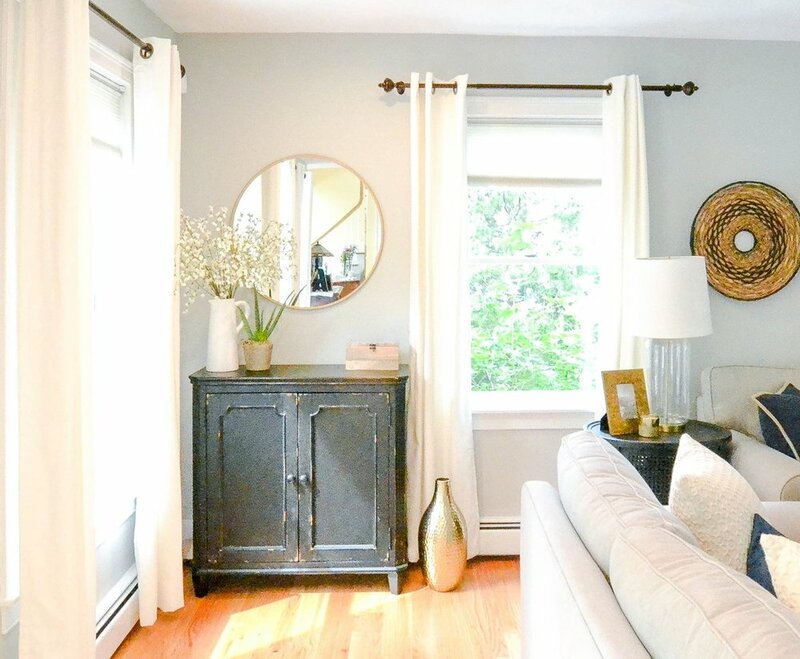 Our Homestead Project featured two brass mirrors on either end of this wide spectrum. There's this beauty, which is on the shiny end. And this lovely round mirror has a muted, matte tone. Finding the perfect mirror for a project takes quite a bit of hunting. Finding two is twice the hunt. Hence, following our Homestead Project, we were very well versed in variety of brass mirrors out there. 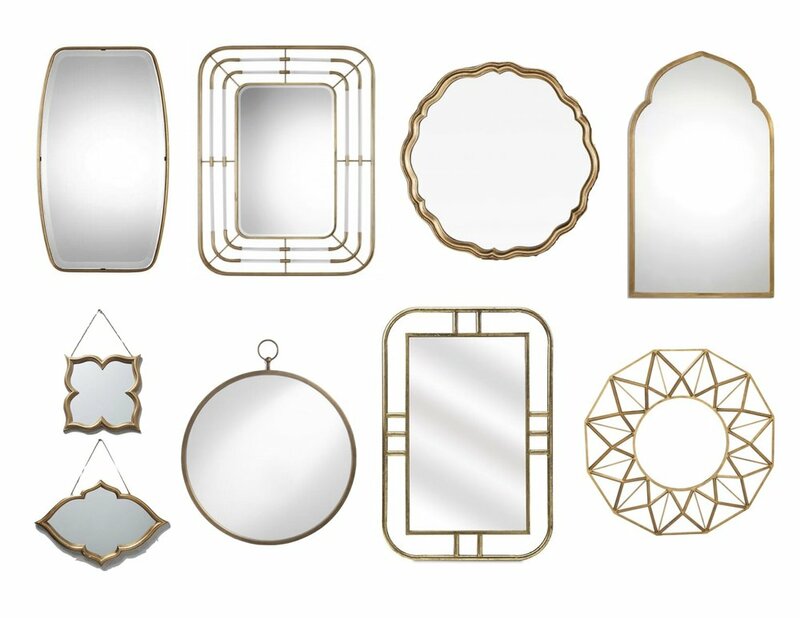 A new project has us researching brass mirrors again - all shapes, sizes and shades. So, at the moment we feel like serious experts in this tiny, but very important decor niche. Today we're sharing some of our favorites. Enjoy! 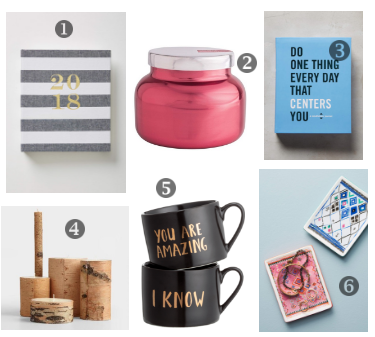 As the New Year approaches and stores are making way to clear their shelves and get ready for the 2018 goods, this is a great time to scoop up some decor to spruce up your post holidays home. Anthropologie is offering an additional 40% off sale items, AMAZING, so it's time to pull the trigger on that special something you've had waiting in your "save for later" cart for weeks now. You might not think of them as a home store, but H&M is also one of our favorite and unexpected shops for unique home goods, and they are also offering some deep discounts this weekend. Check out a few of our favorites picks below, happy shopping and Happy New Years! Who is OVER turkey? First there's the real deal roast turkey on Thanksgiving, then there's turkey soup and then turkey sandwiches and then...more turkey soup. So. much. turkey. Anyone get creative and make turkey meatballs or turkey pot pie with their leftovers? Sonia is wrapping it up today with her gift picks for this holiday season (click here for Michele's picks and here for Leah's picks). With Thanksgiving officially behind us, holiday gift shopping is on. Sonia has some amazing ideas for you and with today being cyber Monday, it's THE day to get gift shopping handled. First up are ideas for your sister, mother-in-law, neighbor who walks your dog, mailwoman who hates Dunkin Donuts giftcards, or...you (no shame in having a wish list!!!). 1. 2018 planner - Help her start the new year right. You can't go wrong with this chambray striped planner. 2. Jar candle - Nothing comes close to the scent of this peppermint candle - so festive. And bonus, it's on sale, which is unheard of for this beauty. 3. Do One Thing Every Day That Centers You: A Mindfulness Journal - Great little journal for anyone in your life who could use a bit of ommmm, which around this busy time of year is just about everyone. 4. Birch candles - These candles come in an assortment of sizes and will be sure to make any holiday party a bit more festive. 5. "You're Amazing" and "I Know" mugs - This set of black and gold mugs are a fun and cheeky addition to any coffee lovers collection. 6. Trinket dish - Who couldn't use a colorful trinket dish to help corral all the little odds and ends that collect on your kitchen counter? 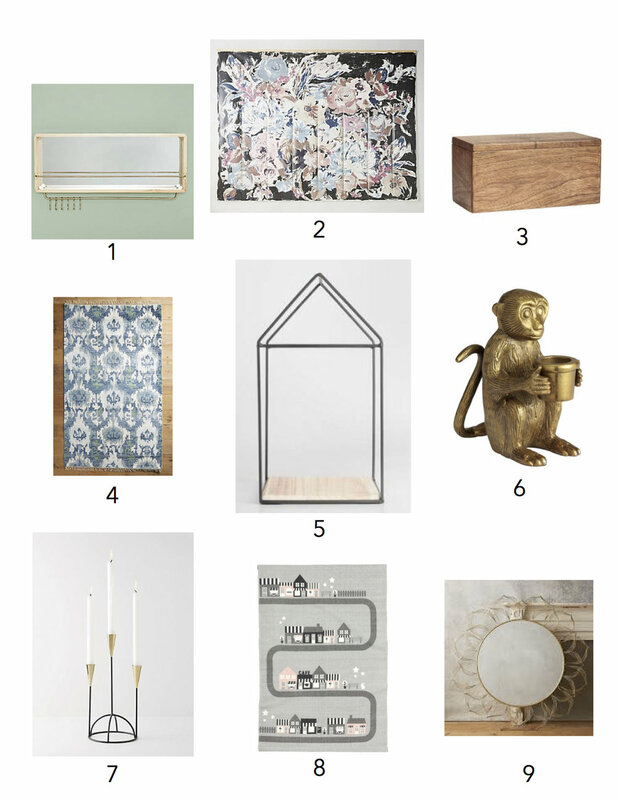 And here are her picks for home related gifts. 1. Cake stand - Pile this blue and gold plate up with some tasty holiday cookies and it will make any hostess's day! 2. Snack bowl - MoMA has partnered with Nordstrom to offer select items in their stores, and this "flooded" snack bowl is on my wish list! 3. Candle holder - I love this metal candle holder, gifted with some white tapered candles and you'll be good to go. 4. Alphabet cookie cutters - For those who like to give gifts that include experiences, these cookie cutters will offer hours of fun for any bakers in your life. 5.. Cable knit faux fur throw blanket - In a neutral beige, this knit and fur blanket will be a cozy addition to any living room. Instead of gifts for him, Sonia rounded up some amazing kid gifts. I think the toddler apron from Anthropologie might be my favorite...and going under the tree for each of my daughters this year (thanks Sonia!). 1. Race car - High quality wooden toy car that will keep little hands busy playing for hours. 2. Unicorn doll - If your little lady is as into unicorns as mine, then this plush little number will be sure to bring some holiday smiles. 3. View master classic - You can't go wrong with this classic, it's made children happy since the 1970's. 4. Wooden dollhouse - Because I would have loved this sweet black, white, and green doll house when we were kids, I'm are betting that little ones nowadays will love it as well. 5. Toddler apron - All hands on deck during the baking season, deck your little helper out in this floral apron and get baking! 6. Pom pom canvas bin - This canvas bin will come in handy to help control the post holiday toy explosion. 7. Magnetic tiles - Kids of all ages love playing with magnet tiles, so do yourself a favor and put out a bin of these colorful tiles at your holiday feast and keep the kids table entertained. Thanks to Sonia for this great round-up and happy Cyber Monday to you! Hope you scoop many, many fantastic bargains.